The Lily of the Valley is one of the most delicate and beautiful of the lily family. With the exception of the orchid family, probably no group of plants furnishes a larger variety of popular forms noted alike for their beauty and delicacy. It has been truly said of the lily family that " the flowers of most are beautiful, of many brilliant, and some truly splendid." This family contains about one hundred and fifty genera and over thirteen hundred species. They are world-wide in their distribution, excepting the Arctic zone, though they are more common in the temperate and subtropical regions. Among the species sought by the lover of cultivated flowers, none is more noteworthy than the tulip, a native of Persia. It is claimed that there are more than seven hundred forms of the tulip known to the florist-all variations of a single species. The type of the family is the lily. The lily is the Persian personification of night, lil or lilleh being essentially the words used to designate evening. To this family also belong the day-lily, the tuberose, the hyacinth, the yucca, and the star-of-Bethlehem. Here also is classed the useful though much-abused onion, the flowers of which, though small, form a most graceful group at the top of the stem, especially in the wild species. 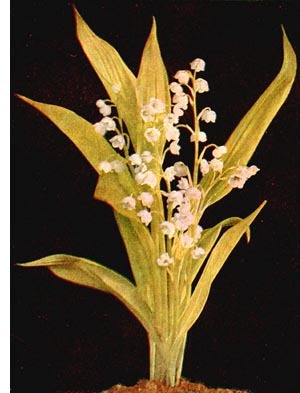 The lily of the valley is a native of the mountainous regions of Virginia and southward through Georgia. It is identical with the cultivated form, which was brought from Europe. The pure white of the flowers, as well as their symmetrical form, has led writers to speak of them as the symbol of purity, and no flower, perhaps, is in greater demand for the decoration of the church and home.